Wisdom teeth in teenagers, officially referred to as third molars, are usually the last teeth to develop between the ages of 15 and 18 years. They are located in the very back of your mouth, next to your second molars and near the entrance to your throat. You will have four wisdom teeth, two on the top (one right and one left) and two on the bottom (one per side). Third molars are usually completely developed between the ages of 15 and 18, a time traditionally associated with the onset of maturity and the attainment of “wisdom.” While most other teeth have fully erupted by age 12, this is the time when the wisdom teeth are starting to calcify and form. The average mouth usually has enough room to hold only 28 teeth. When the third molars do not have enough room to erupt, they can form in various different angulations, also known as being impacted. This lack of space can result in a number of harmful effects on your overall dental health. When a tooth cannot erupt into proper alignment, we call it impacted, which simply means, “stuck” in an improper position. When a wisdom tooth is blocked from erupting, it is called impacted. There are many different forms of impaction, whether vertical or horizontal. The extraction of wisdom teeth is necessary when they are prevented from properly erupting within the mouth. They may grow sideways, partially emerge from the gum, and even remain trapped beneath the gum and bone. 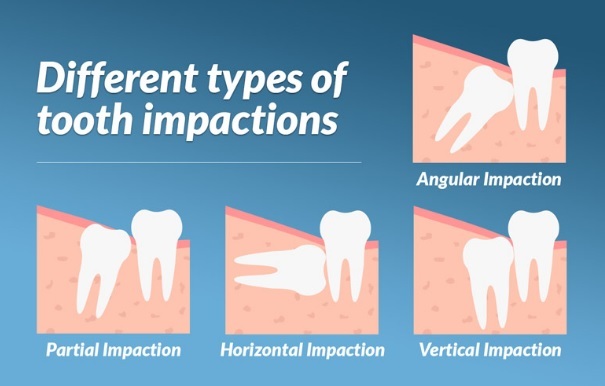 Impacted teeth can take many positions in the bone as they attempt to find a pathway that will allow them to successfully erupt. Even when they align properly and fully erupt, they are very difficult to maintain proper hygiene and at a high risk of problems in the future. Soft Tissue Impaction- There is adequate jawbone to allow the wisdom tooth to erupt, but not enough room to allow the gum tissue to be properly positioned and attached to the tooth. Because it is difficult to keep the area clean, food can become trapped below the gum and cause an infection and/or tooth decay, resulting in pain and swelling. Partial Bony Impaction- The tooth has partially erupted, but a portion of the crown remains submerged below the gum and surrounding jawbone. It is difficult to keep the area clean, infection will commonly occur. Complete Bony Impactions- The tooth is completely encased by jawbone. By the age of eighteen, the average adult has 32 teeth. Unfortunately, the average adult mouth is only large enough to accommodate 28 teeth. If you do not have enough room in your mouth for your wisdom teeth to erupt into proper position, they can cause many problems. Infection- Impacted teeth can be partially erupted, causing a deep opening around the teeth that allows bacteria to grow and become infected. The flap of tissue that covers the partially submerged wisdom tooth (called the operculum) creates a deep pocket that cannot be properly cleansed even with proper brushing and flossing. As debris and bacteria accumulate, one can experience cycles of pain and pressure due to inflammation and infection. This condition is called pericoronitis. Once the impacted tooth is removed, the deep pocket will disappear along with the symptoms. Damage to adjacent teeth– If there is not enough room to adequately brush and floss around the wisdom tooth, the tooth directly in front of the wisdom tooth (the second molar) can be adversely affected resulting in gum disease (bone loss) or cavities (caries or decay). Crowding of teeth– Some dentists and orthodontists believe that pressure and force from erupting wisdom teeth can cause movement and relapse of orthodontically aligned teeth. This crowding is usually most noticeable in the lower front teeth and is most commonly seen after a patient has had braces. There are most likely a number of factors that cause our teeth to shift and impacted wisdom teeth may play a contributory role. Although wisdom tooth removal cannot be recommended solely to avoid crowding, it can be recommended in order to absolutely eliminate any possible role in future crowding and other bite changes. This movement happens very slowly over months and years and the removal of the wisdom teeth and use of your orthodontic retainers could prevent this potential problem. If you do not have enough room in your mouth for your wisdom teeth to erupt into proper position it is best to have them removed before the wisdom teeth are fully developed. For some patients this may be as early as 13 or 14, for others it may be as late as 17 or 18 years old. Without a doubt, younger patients (teenagers) heal faster, and in a more predictable fashion, and with fewer complications than older patients. X-rays can determine if you have impacted wisdom teeth, which means you’re going to have to get them removed eventually. The earlier you get your wisdom teeth removed, the easier the process is. Waiting until adulthood, when the roots are more fully formed and the bones around your teeth are more dense, the procedure can become complicated and be much more painful. Make an appointment with your dentist in Fresno CA, Dr Donan to see if you need to remove your wisdom teeth or if you have pain because of your wisdom teeth.